Last week I made a recipe to fit the 113 degree heatwave we had in L.A. This week is a new recipe to fit the rainy and cool L.A. weather. Crazy, huh? I’ve never made such a dish before, not sure if I’ve even had it before, but this soup sure is tasty and perfect for rainy days. This is comfort food at its finest. From carrots and peas to lean chicken and doughy dumplings, this one-pot meal is all you need. Make a batch to last you the entire week and the leftovers taste even better the next day. This would actually be perfect before a big endurance event, the mix of potatoes and dumplings would give you all the energy you need to tackle any race distance. I actually used Bisquick Heart Smart mix for the dumplings because I had it on hand. If you don’t have it, you can make basic dumplings with flour and water (recipe below). For light and fluffy dumplings, the trick is to not peek into the pan while they are cooking. The dumplings need to cook in the steam generated by the simmering stew. This dish is best eaten curled up on your couch watching some trashy tv, in my opinion. 1. In a large pot, heat oil and add onions and carrots. Whisk in all-purpose flour. Add chicken broth and bring to a boi, stirring constantly. Throw in chopped chicken breasts and season with salt and pepper. Cover, cook stirring occasionally. 3. Stir peas into pot. 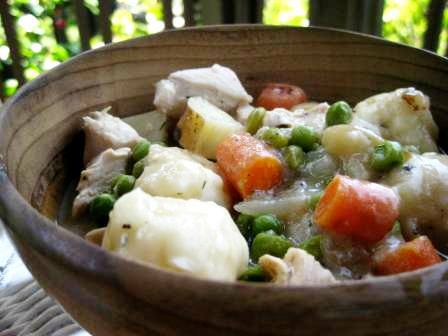 Cover and simmer until chicken is tender and dumplings are firm, around 15-20 minutes. Serve immediately. I like how you are not afraid to try to make things you never have before. I don’t think I’ve ever had dumplings (or if I have I did not know that was what they were called). Your dish looks warm and filling. Thanks for sharing. This looks fantastic! I love chicken and dumplings, and you’re right–it’s true comfort food. I’m going to put this recipe in my book to make this winter. In the middle of an Illinois winter, it will be PERFECT.